And invitations for this year’s annual Mother-Daughter Valentine Tea Party? The absolute, stinkin’ darling-est card of them all! "Look, Aunt Robin, we have matching shoes!" I think these two partners in crime dipped their pinkies into the tea to give it its sweet! Can someone PLEASE tell me why the statute of limitations for "cute" expires when you hit double digits? And, while you’re at it, explain to me why it looks like I have a can of Skoal in my pocket?? And if you ask me if I’m pregnant…I will hunt you down and shatter your knee caps ( a) this was after lunch, and b) it’s all about the camera angle). My spunky co-hort is my baby sister-in-law and I’m thinkin’ she’s gonna hurt me if she sees this. Don’t tell, k? “When did you last have a tea party? When was the last time you enjoyed a cup of tea with someone you cared about? Isn’t it time you did again? …perhaps the idea of a tea party takes you back to your childhood. Do you remember dressing up and putting on you best manners as you sipped pretend tea out of tiny cups and shared pretend delicacies with your friends, your parents, or your teddy bears? 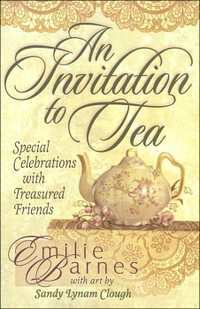 Were you lucky enough to have adults who cared enough to share tea parties with you? And are you lucky enough to have a little person with whom you could share a tea party today? Is there a little girl inside you who longs for a lovely time of childish imagination and “so big” manners? It could be that the mention of teatime brings quieter memories–cups of amber liquid sipped in peaceful solitude on a big old porch, or friendly confidences shared over steaming cups. But even if you don’t care for tea–if you prefer coffee or cocoa or lemonade or ice water, or if you like chunky mugs better than gleaming silver or delicate china, or if you find the idea of a traditional tea overly formal and a bit intimidating–there’s still room for you at the tea table. Few can resist a tea party when it is served with the right spirit. You see, it’s not the tea itself that speaks to the soul with such a satisfying message. And it’s not the teacups themselves that bring a message of beauty and serenity and friendship. It’s not the tea, in other words, that makes the teatime special. It’s the spirit of the tea party. It’s what happens when women or men or children make a place in their lives for the rituals of sharing. It’s what happens when we bother with the little extras that feed the soul and nurture the senses and make space for unhurried conversations. And when that happens, it doesn’t really matter what fills cups of holds the liquid. It really isn’t the tea. It’s the spirit of the tea party. 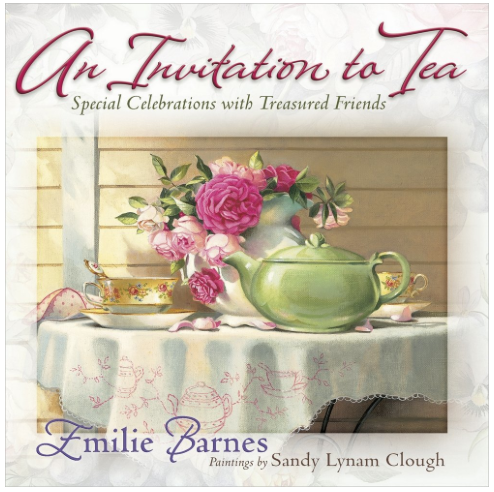 Excerpted from Emilie Barnes’ “An Invitation to Tea”. 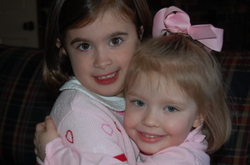 Thirteen years ago, my mother-in-law timidly asked me if I’d be interested in hosting a mother-daughter Valentine tea party for my then three-year-old daughter, her first grandchild. After giving birth to four sons, she was delighted, finally, to have a little girl with whom to celebrate life, and it came eagerly and generously in the form of darling dresses and doll babies, treasures and trinkets. And tea sets. The perfect tea set. Sarah delighted in little girl tea parties with the joie de vivre of her toddler companion; it mattered not if they were filled with imaginary confections or apple juice and sugar cookies. Before Rachel had full command of her speech, she was taught how to serve and how to be served, and she had equal affection for both. 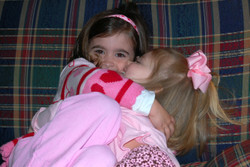 Rachel thrived on her Noni’s undivided attention, and sometimes they even invited Grandy to join them. 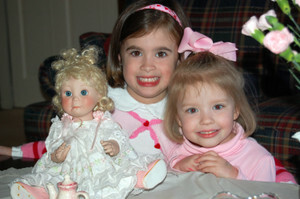 Those tea parties sometimes lasted longer than their real-life counterpart! Perhaps this was the genesis of Sarah’s Valentine Tea Party idea, but I imagine it pre-dated Rachel’s birth. Before the age of ultrasound, every time she was pregnant, Sarah was certain “this time” she’d have a daughter. Rachel’s arrival had been anticipated for 30 years. Over the past 13 years, the Valentine Tea has taken many forms. The first few years found pre-schoolers and their mothers arriving dressed in their Sunday best. 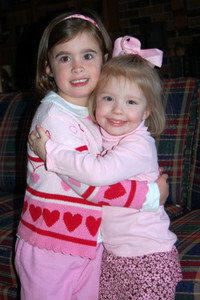 In addition to ribbons and lace, the girls were adorned with all manner of grace and “best behavior”. For the first five years or so, we made a card for the fathers (since they weren’t invited), and a Valentine-related craft. The menu was a child’s dream–heart-shaped PB&Js, heart-shaped Jello Jigglers, heart-shaped cookies, heart-shaped butter mints. Fare for the moms was a bit more traditional–chicken salad and croissants, strawberry creme puffs, fresh fruit. In time, I decided to do something “more” with the Tea. Intentional about reaching young hearts, for several teas, I read a “moralized” Valentine story to them (you can find a variety of these at your local Christian book seller); other years, attempting to cultivate “other-mindedness”, I asked the girls to bring diapers and wipes for us to give to the local crisis pregnancy center. The last few times I hosted it in South Carolina, the girls could come without their moms, and somehow they always ended up IN the creek in our backyard (the first year that happened, they were still dressing in Sunday best! Oh, how I remember the mud on one of the girl’s white, chiffon-layered, junior bridesmaid dresses…:/). There were always surcies for mother and daughter, finding perfect treats was one of my favorite parts of the Valentine Tea. I’d scout all year for “nice” things at bargain prices, then squirrel them away until tea time. 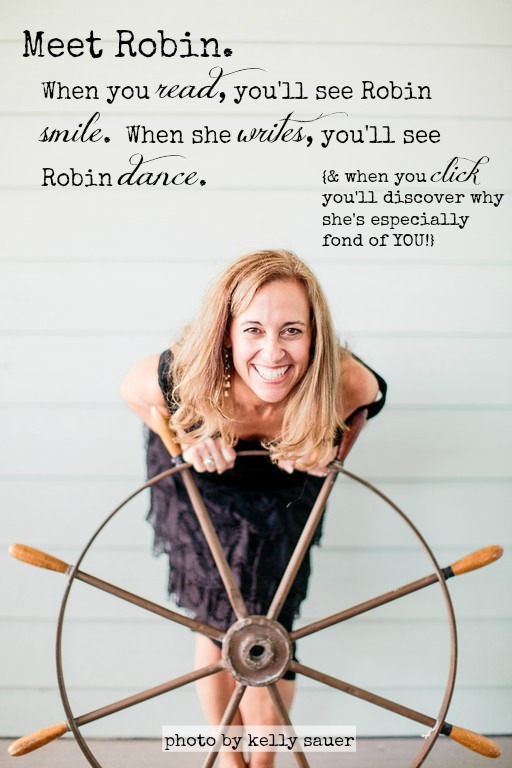 As a “words” girl, creating each year’s invitation has always been fun, too. Usually, I’d write a poem invite (no surprise there), but over the past few years, I’ve loved making Stampin’ Up creations. This year’s is decidedly non-Valentine-ish–I wanted to stay away from “traditional” pink and red and went with a totally different color scheme. When we moved to Tennessee 4 1/2 years ago, I couldn’t let our tradition die. It meant too much to my mother-in-law, and surprising to me, it meant too much to me. Once again, we tweaked the Tea to fit our stage in life, and it became a family affair–my sisters-in-laws, their daughters, my mother-in-law’s best friend and sister-in-law, too. All the younger girls get to invite one friend along with their mothers. I’ve come to appreciate the tradition of our Valentine Tea. It provides a sense of identity to the women in our family; it binds us together and strengthens family (and friendship) ties. It brings a dimension and richness to a holiday known for celebrating romance, and for us, instead, fosters a different sort of “love”. It means more and more to me every year. 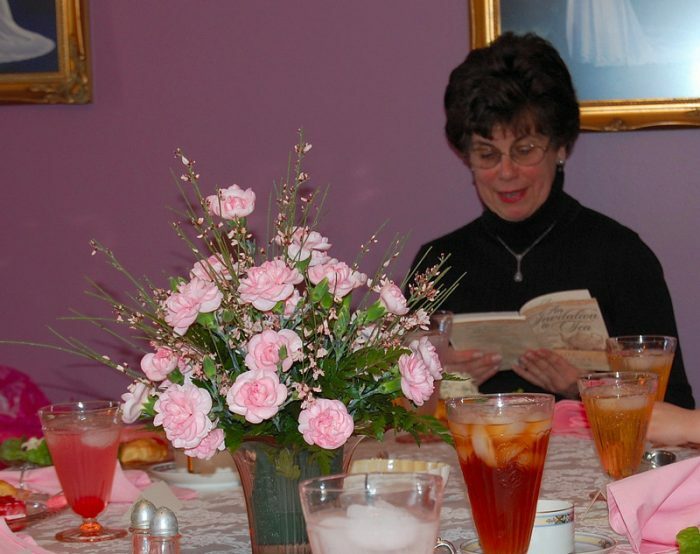 For 12 years my daughter, mother-in-law, Sarah, and I have hosted a mother-daughter Valentine Tea Party for our friends and family. Reading the passage below has been how Sarah has begun brunch for the most recent several. Every time I hear it, particularly the sections I’ve bold-printed for emphasis, my heart is moved. This weekend Rachel and I traveled five hours to continue an annual mother-daughter tradition, our twelfth in a row: A Valentine Tea Party. 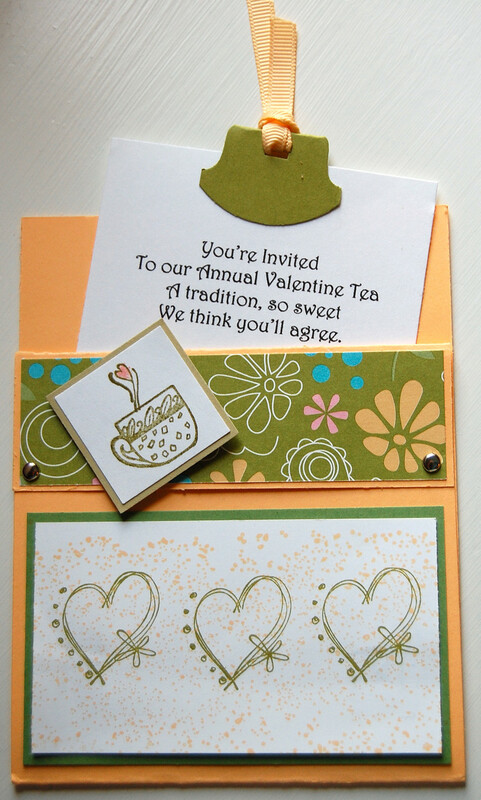 The brainchild and fantasy-come-true of my mother-in-law’s, “tea” has less to do with this than the “valentine” and “party” part. Sarah gave birth to four boys. Before the age of ultrasound, every time she was pregnant, she just KNEW that this time she’d have “sugar and spice and everything nice”……..but every time, instead, it was “hammers and nails and puppy dog tails”. Her shopping gene longed for the day she could buy hair bows and mary janes, smocked dresses and Easter bonnets, baby dolls and …. tea sets! Outside of celebrating a friend’s daughter’s arrival, her “day” never came. Then, I entered the picture. Tad and I dated five years–sometimes off-again, mostly on-again–before deciding to marry, and by that point, Sarah and Tommy knew me very well. They loved me as if I were their own, call me their “first-born daughter” and refer to me as their “daughter-in-love”. Realizing fully not everyone has this kind of relationship with their in-laws, I am ever-mindful not to take it for granted…especially now, having lost both my own parents. I was the Queen Bee until his next younger brother got married and de-throned me, and eventually, I’ve had to endure that process three times, slipping to a lower rung on the ladder each time. I still wear a “crown”, it’s just not as shiny and new. Well, ALL of our reigns came to a screeching HALT when the grands started coming. And because Tad was the oldest…and got married first…it wasn’t that big of a stretch that we’d have the first grandchild. Not JUST a grandchild, but a G R A N D D A U G H T E R. Spun gold. Pure delight. Enchantment of their hearts. She had them wrapped around her tiny perfect pinky the moment they laid eyes on her tiny perfect body. I remember the day Sarah came to me with a “proposition”. 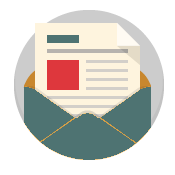 Through the years, there have been many; I learned a long time ago that whatever Sarah asked for, she usually got, because she’s a Steel Magnolia to the core and she understood you get a bushel more flies with honey than vinegar. No ominous “making an offer you can’t refuse” business, by the time she was done asking, her saccharine powers of persuasion had accomplished her goal. In one breath, Sarah began and finished, “You know how Rachel loves her tea set and playing make believe…let’s have a Valentine Tea Party for Rachel…we can make it a mother-daughter thing…and the girls can dress up and eat all their favorite foods…and of course we’ll use the fine china and silver and it WILL BE SO MUCH FUN…and we’ll make it an annual tradition and when she’s 16 we’ll invite boys and it’ll be a “Sweet 16” party!” Exhale. All mothers go crazy when they have their first child, they lose more brain cells giving birth than a frat boy loses following a long weekend binge. It’s a rule. We collectively judge OTHER mothers BEFORE we give birth and say things like “I’ll never…” and “Can you believe what she…” but those are bitter words quickly eaten and we hope nobody remembers we said them in the first place. We BELIEVE our children are the smartest kids on the planet—I don’t know how many times I heard “My child is advanced…” or some derivative of same when I served as director for our Mom’s Day out at my old church. I’d just smile and think silent but hyper-judgmental and condescending thoughts because I was soooo past the delusions of mommydom. With that in mind, in two blinks of an eye, I bought what Sarah was selling. And so began our Valentine Tea Party tradition. Of course, more details, pictures and commentary to follow;). At least I’m not talkin’ rats!